Looking for fun activities to do in Addo? Adrenalin Addo has it all! 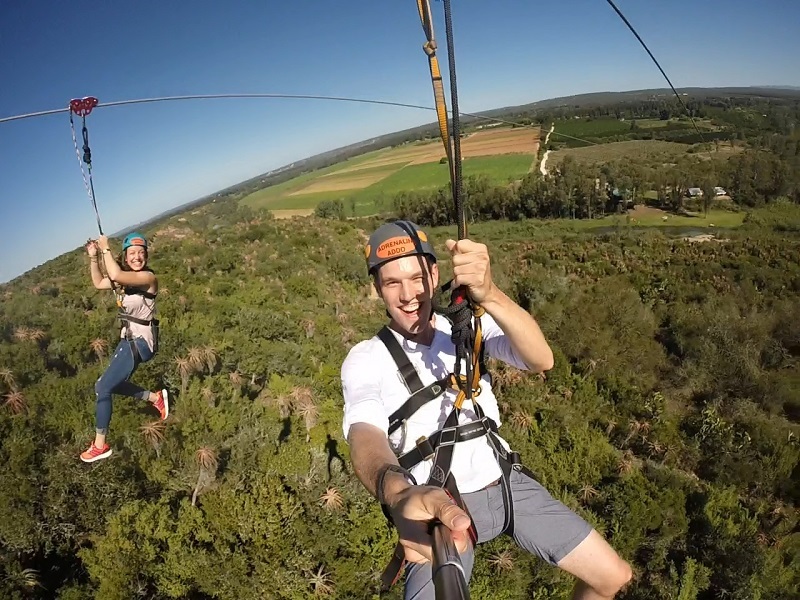 Situated in the heart of the Sundays River Valley in Greater Addo, Adrenalin Addo is an outdoor adventure park that embraces the motto ‘life is for living’. Whether you are looking for some heart pumping action on our zip line or some stomach-losing madness on our giant swing, or something more composed like canoeing on Addo’s Sundays River, Adrenalin Addo’s activities are all about trying new things and above all else, surrendering to boundless fun. Rated as the number one attraction in Greater Addo, we are an ideal getaway for families and friends, and the premier adventure venue for corporate groups and school camps. AND, JUST ARRIVED AT ADRENALIN ADDO…. The Superman Zip line! Take zip lining to the next thrilling level at Adrenalin Addo and experience its flight in superman form – forward facing and prone. Adrenalin Addo is one of only two sites in South Africa to offer this incredible experience: zip lining at its best! Adrenalin Addo is situated between the towns of Addo and Kirkwood, 50 minutes from Port Elizabeth and just 20 minutes from the world renowned Addo Elephant Park. Must we book in advance? We strongly recommend that you book in advance, especially in holiday times. You are however more than welcome to arrive without a booking and we will do our best to accommodate you. Please note every so often we may be closed to the public because of private events or maintenance work. As such, it is a good idea to call ahead. Out of holidays we are open Tuesday to Sunday, 9am – 4pm; closed Mondays. During school holidays, we are open every day of the week, 9am – 4pm. What happens if it rains or the weather is bad? In extreme weather conditions (heavy rain, strong winds and thunderstorm activity) we reserve the right to suspend operations in the interest of client safety. Please always call ahead to check. If you have pre-booked with us and the weather turns on the day of your booking, we will contact you to cancel or postpone your booking. Please note, the weather in Port Elizabeth (PE) is often very different from the weather in Addo; while wind and rain take hold in PE, the sun is often shinning in Addo! Designed and built by qualified civil engineers our zip line has been built to international standards. Our zip line is equipped with the world’s leading braking system, backed-up with a secondary braking system, and as such it complies with US and international zip lining regulations. Our automated braking technology also means that riders do not have to stop themselves, thus eliminating rider risk. Finally, our qualified and experienced guides make it their priority to put client safety first and foremost. Please note we do reserve the right to adjust the weight limits in the event of certain weather conditions such as strong head winds. The zip line is suitable for all ages, providing the weight restrictions are respected. Please note that anyone under the age of 18 years wanting to do our activities must have a parent or guardian to sign an indemnity form for them. We regret that zip lining when pregnant is not permitted in the interest of safety. Zip lining is an adventure activity and we recommend a reasonable level of fitness. Our zip line experience requires a 480 metre mountain hike to the departure platform. Allow approximately one hour for the zip line experience. This includes completing the paperwork, getting kitted-up, a short walk to the launch tower, and, the best bit of all – zip lining! Please note in peak holiday times and on weekends you may have to wait in turn. What should we wear and bring? We recommend outdoor clothes, flat shoes (preferably closed), a hair band to tie up long hair, a hat and sunblock in summer, and your camera! One of only two superman rides in South Africa - zip lining at its best! Hold onto your stomach - the ultimate adrenaline rush!